More than 380 people have been confirmed dead after a tsunami triggered by a magnitude 7.7 earthquake hit an Indonesian city on Friday. A deadly tsunami killed many in the bay city of Palu in Indonesia's Sulawesi island, a hospital official told Metro TV on Saturday after the area was hit by strong earthquakes and a 3-meter tsunami a day earlier. In a video that appeared to be taken at night, doctor Komang Adi Sujendra said 380 people were killed and had been taken to the hospital where he was, adding that another 400 were injured. Authorities were having difficulties coordinating rescue efforts as the 7.7 magnitude quake caused a power outage that cut communications around Palu and the nearby fishing town of Donggala, the closest to the epicenter of the quake 27 km away. Officials had not yet provided any new information on the death toll on Saturday, but on Friday night they said initial reports showed some dead victims in the rubble of collapsing buildings. Disaster agency spokesman Sutopo Purwo Nugroho said the tsunami caused by the earthquake hit Palu, the capital of central Sulawesi province, as well as the smaller city of Donggala and several other coastal settlements. "The cut to telecommunications and darkness are hampering efforts to obtain information," he said. "All national potential will be deployed, and tomorrow morning we will deploy Hercules and helicopters to provide assistance in tsunami-affected areas." The region was rocked by a magnitude 7.7 earthquake Friday and numerous strong aftershocks, including one of magnitude 6.7. 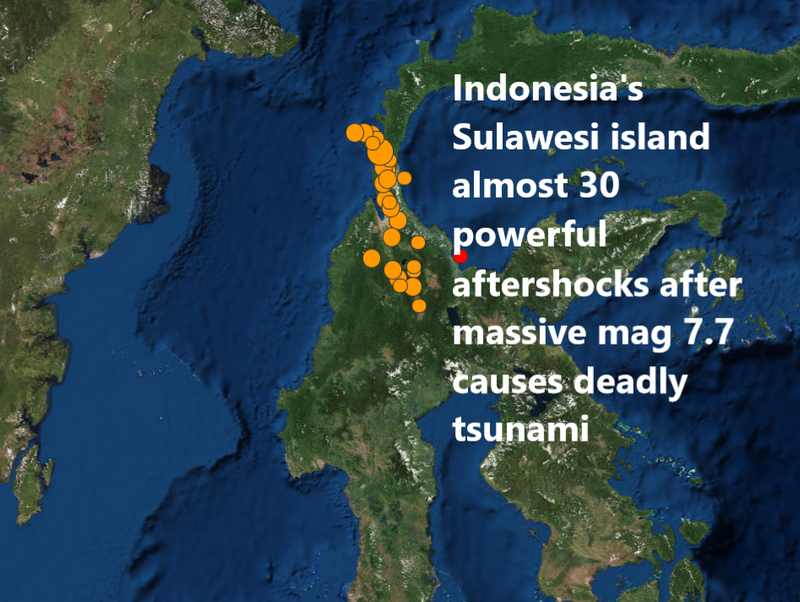 An earlier magnitude 6.1 quakes in central Sulawesi killed several people, injured 10 and damaged dozens of houses. The chief of the meteorology and geophysics agency, Dwikorita Karnawati, said the tsunami waves were up to three meters high. She said the tsunami warning triggered by the biggest quake, in place for about half an hour, was lifted after the tsunami was over. Sutopo said the military was deploying troops to Palu and Donggala and the national police were also mobilizing to help the emergency response, as well as personnel from the search-and-rescue and disaster agencies. "People are encouraged to remain vigilant," Sutopo said. "It is better not to be in a house or building because the potential for aftershocks can be dangerous. People are encouraged to gather in safe areas. Avoid the slopes of hills." Palu's airport halted operations for 24 hours due to earthquake damage, according to AirNav, which oversees airline traffic in Indonesia. Mirza Arisam, a resident of Kendari, the capital of neighboring Southeast Sulawesi, said his uncle and his family of five, including three children, were on vacation in Palu and he has been unable to contact them since the tsunami hit. After the 7.7 quake struck, television footage showed people running into the streets. Women and children wailed hysterically in a video distributed by the disaster agency, which also released a photo showing a heavily damaged department store. The strongest I ever felt. We all ran out of buildings," said Yanti, a 40-year-old housewife in Donggala who goes by a single name.